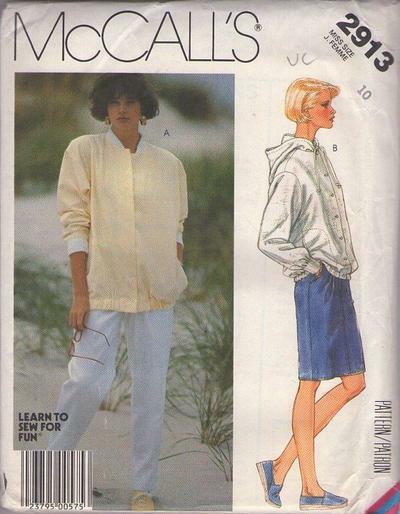 1987, 80s Separates, Retro Beginners Clothing Patterns - MISSES' UNLINED JACKET, SKIRT AND PANTS: Jacket A or B with extended shoulders has shoulder pads, long sleeves with ribbed knit cuffs, buttoned or snap fastened front closure, top stitched side seam pockets and elastic in lower casing. Jacket A has ribbed knit collar. Jacket B has hood with drawstring in casing. Straight skirt, or tapered pants have front pleats, inset pocket, front zipper opening, waistband, belt carriers and top stitching. Skirt has back vent.